In 4-quart saucepan, pour in broth then stir in carrots, celery, beans; heat to boiling on high. Reduce heat to low and simmer 5 minutes or until vegetables are tender. Stir in turkey and heat through. Add cooked pasta noodles and continue to simmer for five minutes, remove saucepan from heat; stir in parsley. Makes approx. 12 cups. To store: cover bowl and refrigerate. 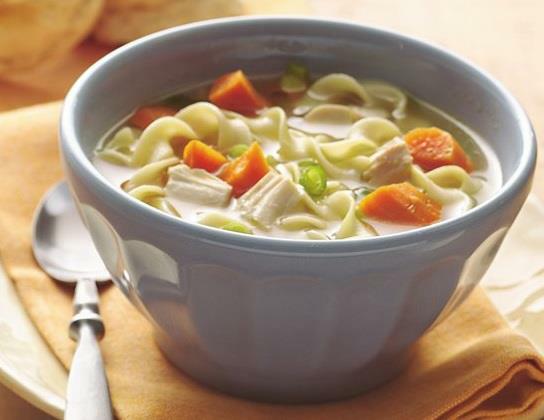 Refrigerate safely up to three days or freeze soup in 1-quart portions to use within 5 months. With permanent marker, place the date the soup was prepared on the outside of the container for safe storage. **** There may be times when it is too challenging to digest the ingredients in this meal, All is not lost. Consider placing serving in a blender/food processor to quickly blend all ingredients together creating a smoother consistency. Maintaining nutrition and hydration is very important when the body is fighting any infection. When a patient is unable to maintain adequate hydration or nutrition please contact and report symptoms to the healthcare provider and/or visit the local clinic/hospital for assessment and treatment. Dehydration and malnutrition can be life-threatening – do not delay in receiving treatment. This entry was posted in Nutrition and tagged c diff, C. diff nutrition, cdiff, Cdiff hydration, Cdiff nutrition, Clostridium difficile, Nutrition, soup, Turkey, what to eat during a Cdiff infection on January 31, 2015 by cdifffoundation.